IT IS not often that a matchday starts with a brief encounter with two 1970s pop music icons, but bumping into Russell and Ron Mael, AKA Sparks, was how Game of the People’s trip to Brocton versus Deeping Rangers got underway. St. Pancras International is often a good place to do a bit of celebrity watching and as I walked through the station, I bumped into two characters who were conspicuous by their appearance. They’re beyond middle-age now, those Mael brothers, but my encounter recalled how in 1974 I purchased their album, Kimono My House, walking from South Ockendon to Grays to save on the bus fare! How could Brocton and Deeping live up to that? It was a big ask, but even a relatively simple trip to Stafford was not without drama. “I’d like to go to Brocton football club,” I asked the taxi driver at Stafford station. “No problem, sir.” Fifteen minutes later, we were weaving our way through the picturesque village of Brocton (population 1,082). So, back to Stafford, where Brocton FC currently play. “We moved a few years ago because we needed to develop our ground,” explained a Brocton official. “We played at Rowley Park for a while, but now we’re here,” he added, sweeping his hand across the neat and functional ground. The ground is set among some well-heeled housing and Brocton clearly have to look after their neighbours. There are signs around the ground warning that musical instruments are not allowed and in the dugouts, notices that request moderate language. Also, a little reminder that the toilets are in the ground, which makes you wonder if dugout occupants have taken the easy option of reliving their bladders on the training pitch! It’s arguably one of Brocton’s biggest games in their recent history, a FA Cup first qualifying round tie at home. In 2013-14, they did reach this stage, but were beaten by Halesowen Town. This season, they’d won against Cadbury Athletic and Gresley. Brocton were relegated from the Midland Football League Premier Division last season, so they are currently getting used to life in Division One after three years in the top flight. After five games, they were just below halfway having won as many games as they’d lost. “How many you expecting today?,” I asked the legion of gatemen at the ground’s entrance. “No bloody idea whatsoever. Maybe Deeping will bring a few supporters. Where is Deeping, any idea?”. Having seen them in every previous round, I knew enough to tell them it would be tough. And so it proved. Deeping started well with plenty of pace and in the 11th minute, a superb strike by Charlie Coulson gave them the lead. Brocton had a couple of half chances, notably a shot by Dave Berks that was well saved by Deeping’s stand-in keeper Danny Bircham, and a header by Leon Taylor that went just wide. By half-time, it was going to form, Deeping were favourites to win from the start, but you couldn’t fault the effort or enthusiasm of the home team. In the 55th minute, it was 2-0, though, with Scott Coupland scoring from the penalty spot after Scott Mooney had been brought down by Adam Wood. Two minutes later, the tie should have been sewn-up as Danny Schiavi turned and shot home all in one movement. 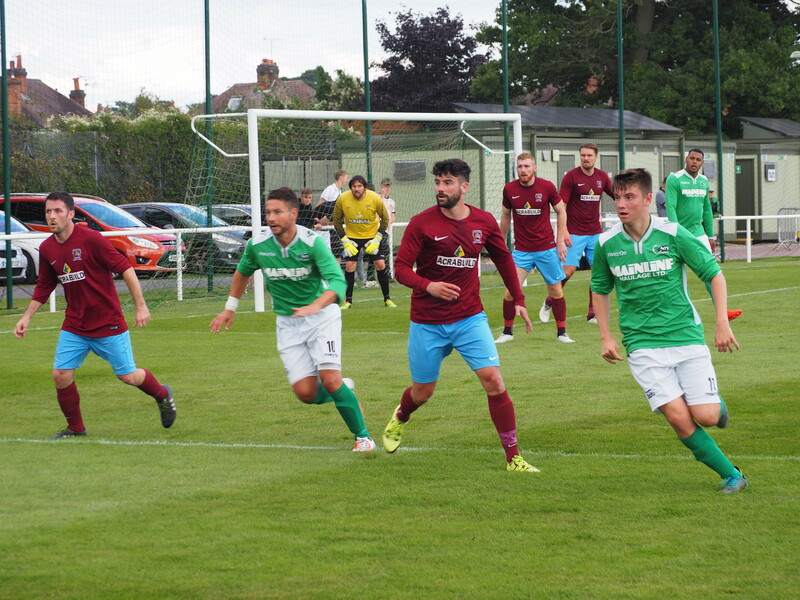 Deeping looked home and dry, but similar to their game at Peterborough in the first stop on this FA Cup tour, they took their foot off the peddle. Brocton made some substitutions and the game changed. They had a goal disallowed for offside before they began their comeback, but in the 73rd minute, a low shot from Jamie Evans reduced the arrears. Surely, this was no more than a consolation? Not so, for two minutes on, a determined run down the flank by Joe Hartshorne ended with Paul McMahon scoring from close range. 3-2. The game was open again. 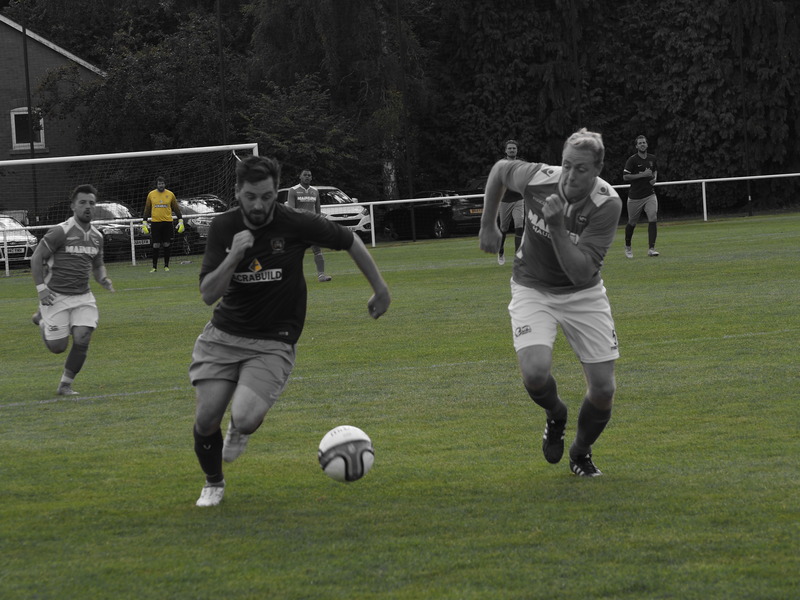 Deeping exploited some time-wasting tactics which made the game scrappy and upset Brocton’s flow. In the final minute, the visitors scored again, another tap-in from six yards from Jason Kilbride. 4-2. Three away draws, three wins. Sooner or later, Deeping should get a home tie. But they’re on a bit or a roll and they’ve now equalled their best ever run in the competition. As for Brocton, they played their part in a cracking cup-tie and in the most enjoyable afternoon of this FA Cup odyssey. We’re aiming to follow Deeping in the next round. Yes you were right a cracking game in the end.Deeping are a good side run by nice people and appreciated our hospitality and acknowledged what we had achieved at our ground.best of luck for them in the next round.